Free Shipping for orders over $50 - Need Help? Call Us, Email Us or Chat with Us! 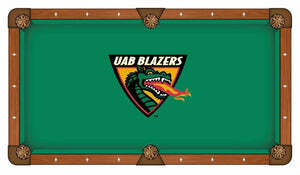 Holland Gameroom is proud to offer this professional quality, Officially Licensed Logo Pool table. 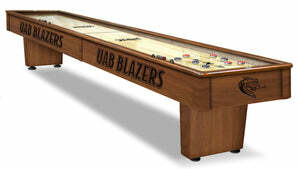 The billiard table is constructed from solid hardwood. The double-arch cabinet features beautiful CNC routing that accentuates the laser engraved logo art elements. Coordinating, embossed leather pockets with riveted nets match the look of the table and profile of the rail. The Diamond Pearl Sites are seamlessly inlaid into each of the rails for precision aim capabilities. The cabinet finish is second to none and incorporates a 14 step stain and lacquer process to ensure the high quality, furniture like finish you would expect from a table of this caliber. You choose from either of the two finishes, Chardonnay or Navajo. For the play surface, a 3 piece, diamond honed, 1” thick slate is utilized for sure and consistent ball play. Covering the slate and bumpers is Hainsworth worsted cloth. Don’t be fooled by “professional” cloth offered on other tables, this is the real deal! Hainsworth cloth is renown as one of the best pool cloths in the world, their custom printed logo cloth is a highly technical and innovative playing surface. Finally, the table sits on your choice of legs. 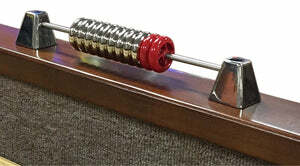 Choose from either the hand carved traditional Ball & Claw leg or the more contemporary, Taper leg. If you are in the market for a high quality, Officially Licensed Logo Pool Table, look no further than this one from Holland Gameroom! Hainsworth custom printed, logo billiard cloth. Best cloth in the industry! Here at Epic Game Room, we value our customers. We strive to make our customers happy, by providing a smooth purchasing experience and caring about our customer's. We understand not every time life happens perfectly, that's where we will stand out. We are going to be there for you in the case something unfortunate happens. 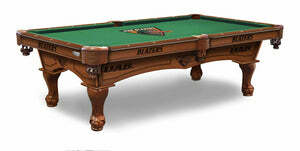 For example, a damaged billiard table arrives at your house after waiting a week... We will be there, making sure you receive a new billiard table in the quickest, smoothest way possible. I have written this guide to make sure our customers are informed for every step of the process. At this moment, we are offering complimentary free shipping on all orders that ship via freight truck, and most that ship via parcel. The complimentary free shipping via freight truck is curbside. The curbside delivery service provides delivery of your item(s) to the curb of your business or residence. This service does not include set up or assembly of items or removal of packaging materials. Unload or Liftgate Service is a service offered on most items requiring shipment by truck motor freight. This is an extra cost option available at the time the order is placed and is in addition to the Truck Freight Charge. The freight carrier will do one of two things, depending on the delivery vehicle. The equipment will be placed on the liftgate of the truck and lowered to the ground. The driver will then take the equipment off the liftgate. If no liftgate is available on the delivering truck, the freight carrier will lower the equipment to the ground. Once off the liftgate or delivery truck, the customer assumes responsibility for any further placement or delivery of the equipment. Carrier delivery agents should unload and place items in the room of your choice. White Glove service generally includes unpacking, removal/disposal of packing materials and transporting your order up or down a maximum of one flight of stairs. We can help you assemble any furniture you need. We personally do not have installation professionals, neither do most of our authorized brands. However, we want to provide as much value to our customers by offering the opportunity for their game tables, bars, and other types of furniture are assembled by external installation companies. Requesting this service will require specific details in order to have the most accurate rate possible. We encourage you to let us know the following details through support@epicgameroom.com in order for us to provide you with the most accurate rate possible. We will respond to your request as soon as possible, and we may ask for additional information. A. Visually inspect all cartons for holes, tears and other indications of rough handling. B. Fully remove merchandise from cartons and visually inspect it for any damage. No matter how minor. Pay particular attention to any areas that correspond to damage appearing on the carton. C. If there is any damage, Accept the damaged shipment. Failure to accept the shipment will delay the claim process. D. Mark the Proof of Delivery document with a notation that the contents are "damaged" or "missing". E. If you accept delivery without any Proof of Delivery notation stating the contents were damaged, YOU will be responsible for all damages, whether or not the damage was noticed at the time of delivery. You must understand that your signature on the delivery receipt indicates you are accepting the merchandise in "GOOD ORDER"
F. Immediately reach out to us describing the damage and attaching pictures of the damaged item. G. We will be working towards processing an insurance claim for the item that has arrived damaged. C. If there is any damage, you are not obligated to take delivery. You have the right to refuse delivery and if you do, YOU MUST CALL IMMEDIATELY and notify us about the refusal of delivery. E. If you accept delivery, YOU will be responsible for all damages, whether or not the damage was noticed at the time of delivery. Your customer must be made to understand that their signature on the delivery receipt indicates they are accepting the merchandise in "GOOD ORDER"
If you're not satisfied with an item that you purchased you can initiate a return within 30 days after delivery for a refund as long as the item is in its original condition and packaging. Items that have been used or modified in any way may not be returned. Orders returned, for reason other than a defective item (upon receiving), are subject to a restocking fee that is equal to 38% of the price of your order. You (the buyer) are responsible for any return freight (shipping) costs for BOTH directions (from the warehouse to you, and back to the warehouse). The purchase price minus these fees and costs will then be refunded to you when the warehouse processes your item (product must be returned within 30 days, new, unused, and in original packaging). Refunds will only be issued to the original credit card that you use when placing your order. Orders canceled later than 12 hours after purchase are subject to an 18% cancellation administration fee. Please make sure to measure the necessary space requirements, etc. before purchasing! After 30 days, we will help administer a return only if the item is damaged and still under manufacturer's warranty and in accordance to our policies as well. The manufacturer's warranties vary from 1-3 years depending on the company. We stand by our high-quality products and your satisfaction is 100% guaranteed. Please read Shipping & Returns Policy for details. Become a Epic Game Room Insider we'll keep you up-to-date with the latest offers. © 2019 Epic Game Room. All rights reserved.